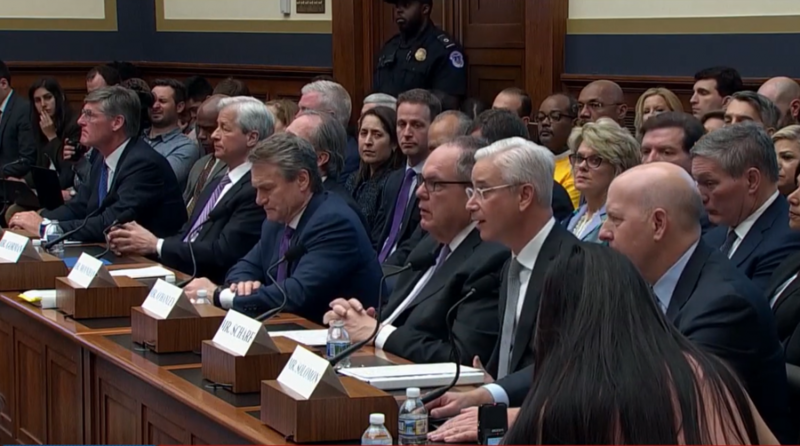 CEOs of big banks faced the music of Capitol Hill questioning on Wednesday, but the cacophony did little to affect the Financial Select Sector SPDR Fund (NYSEArca: XLF). XLF was down just 0.19 percent as of 12:30 p.m. ET. Furthermore, XLF is up 8.48 percent year-to-date. All the government finger-wagging is a precursor to first-quarter earnings scheduled to kick off on Friday with the big banks reporting–some of which are currently being grilled by the House Financial Services committee. XLF is still trading just below its 200-day moving average, but did cross the line a couple of times thus far in 2019. As far as whether it presents a value play or a warning to “stay away” could depend on how well the banks do when they reveal their first-quarter earnings. Wall Street analysts are already expecting a less-than-stellar earnings season for the first quarter. Investors are looking at a 4.3 percent year-over-year reduction in earnings growth, according to FactSet estimates. Related: Can a Dovish Fed Keep the Stock Market Rally Afloat? However, not all of Capitol Hill was ready to rain down fire and brimstone on the banks.